In a season where Real Madrid have been besieged by crisis, a shining light is emerging in the form of Vinicius Junior. Los Blancos jumped the gun by agreeing to spend close to £40 million on the player in May 2017. Vinicius was just 16 at the time so it was an enormous fee to pay for a raw, unproven talent. Real were finally able to complete the transfer after his 18th birthday last July and Vinicius has since been, unwittingly or otherwise, a key piece in the soap opera that has been Real Madrid this season. He was one of the most talked about players in Spain, even when he was nowhere near the Real Madrid first team earlier in the season but in recent weeks he has finally been allowed to showcase his obvious abilities and the early signs are that the Brazilian has the potential to develop into a top player. He shone again for the Castilla side. It is giving Lopetegui a decision to make. As Vinicius Junior knocks on the door. During the early part of the season, Vinicius effectively became a pawn in a battle of wills between Julen Lopetegui and the Real Madrid board and a symbol for the disharmony that existed. 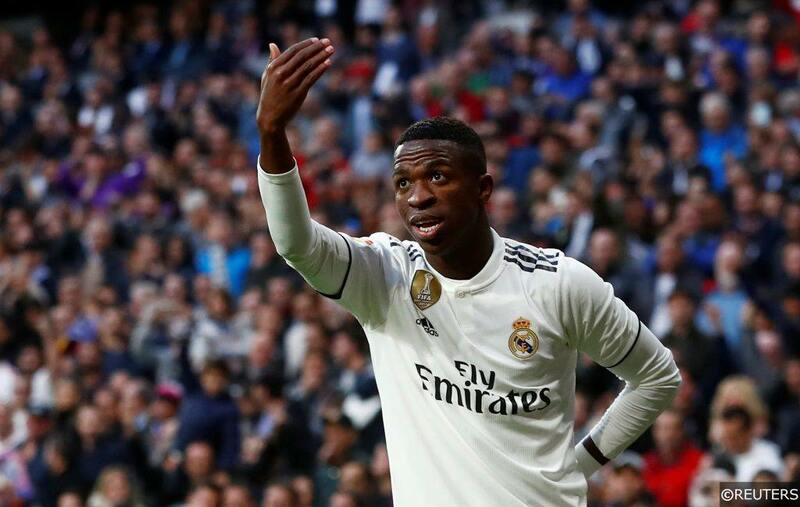 Having spent so heavily on the player, Florentino Perez and co weren’t best pleased when Lopetegui quickly decided that Vinicius would be part of the Real Madrid Castilla squad rather than a fully fledged member of the first team. It all meant that rather than facing off against the cream of the crop in Spain and Europe, Vinicius started off the season playing in front of crowds often measured in hundreds rather than thousands in Spain’s third tier. Early opponents included Unionistas de Salamanca and Cultural Leonesa and in five appearances in the Segunda B, Vinicius showed various sides of his character with four goals and five yellow cards with the latter two resulting in a red against Celta B.
Vinicius’ frustrations at being overlooked by Lopetegui were clear at a time when the senior team was in the midst of their worst ever goal drought. A clamour for Vinicius to be given his chance reached breaking point heading into October’s clasico. Real Madrid lodged a successful appeal to have Vinicius’ Castilla red card overturned, to ensure he would be able feature in the game at Camp Nou. Julen Lopetegui responded by not even naming Vinicius amongst the substitutes for the fixture, despite significant pressure to do so. That decision enraged the Real Madrid board almost as much as the result and it was no surprise when Lopetegui was handed his marching orders in the immediate aftermath of the 5-1 humbling. A change at the helm led to Vinicius getting his chance just days later as Santi Solari named the Brazilian in his first starting eleven, for the Copa del Rey trip to Melilla. Vinicius set up two goals in a 4-0 win to only add to the hype surrounding the teenager. His sheer presence helped lift the crowd and the team performance the following weekend. Labouring against Real Valladolid, Vinicius came off the bench to inspire Real to a 2-0 win with both goals coming in the final 10 minutes. The former Flamengo man was actually credited with the opener despite an enormous deflection. However despite plenty of flashes of his raw talent, many of Vinicius’ first outings for the senior side drew accusations that there was more style than substance. A bit like Cristiano Ronaldo during his early days at Old Trafford, he seemed incapable to resist the urge to showboat. For every lively break and piece of skill, there was a misplaced flick or trick that helped shed light on just why Lopetegui had been unwilling to place much faith in the Brazilian. Already a crowd favourite, the Bernabeu faithful is clearly willing to show a rare display of patience when it comes to Vinicius. With pace to burn, he is an exciting player to watch but his finishing also let him down early on and in La Liga at least, he is yet to add to the generously awarded goal against Valladolid. Despite the clear areas for improvement, Vinicius is almost certain to start when Real Madrid host Sevilla this weekend. One reason why he has quickly managed to not only break into the Real Madrid squad but starting eleven, is the struggles of his more experienced teammates. It has been a nightmare season for almost all of his likely rivals for a starting role in Real’s front three. Gareth Bale has failed to get close to filling the gaping void left by Cristiano Ronaldo and has picked up an injury again. Marco Asensio has been a huge disappointment this season while Isco’s increasingly public spat with Santi Solari is unlikely to end any time soon. With Mariano also injured, Vinicius has got his chance on a more consistent basis and increasingly he is justifying his selection. Even in the context of his relatively short Real Madrid career, Vinicius has shown signs that he is developing and maturing as a player. 2019 has seen him make his first two league starts for Los Blancos. He was Real’s best player in the 2-0 defeat to Real Sociedad and again caught the eye with his raw speed as Solari’s men sealed a 2-1 win at Betis, largely thanks to their counter-attacking prowess. He has also scored a wonderful volley in the Copa del Rey since the turn of the year and right now, it’s not too much of an exaggeration to suggest that Vinicius Junior is one of the first names on Santi Solari’s teamsheet. If he can maintain the level of his recent performances, he will increasingly be seen to be outshining Real’s other forward players, no mean feat for a 21st Century born player who is starting to justify the hype. Categories: Blog and Football. Tags: Julen Lopetegui, Santi Solari, and Vinicius. Team Tag: real madrid. League: Spanish La Liga. Sports: Football.